If you can look past the odd design, the Corsair Ironclaw RGB is an affordable, high-performance gaming mouse that big-handed gamers can love. Corsair has just introduced the new Ironclaw RGB gaming mouse. The name is an odd one for the palm-grip mouse, but its large size may just convert some large-handed claw grip gamers over to a palm grip, and its high-performance specs and decent price make it that much more appealing. The Corsair Ironclaw RGB costs $59 (about £45, AU$85) and though we don’t have exact international pricing yet, it launches globally today. The price is fair, but that does put it in direct competition with the best gaming mice like the $59 (£59, AU$99) Steelseries Sensei 310 and Rival 310, as well as the company’s own wireless Dark Core RGB SE at its discounted price. While the Corsair Ironclaw RGB is a good offer, even adding in static DPI indicators and a braided cable where Steelseries lacks them, its design holds it back just a little. That said, for anyone with big hands, it’s an easy winner. The Ironclaw RGB uses a curious combination of materials. The palm and primary mouse buttons are a matte black, soft-touch plastic that feels pleasent, but can get a little greasy (not as bad as we’ve seen from other soft-touch materials though.) Then there are hard black plastics on either side of the soft-touch section, and those are further bordered by the side grips that give off a reflective shimmer. The DPI and Profile buttons are made of a glossy black plastic, the thumb buttons use the plain black plastic, and the scroll wheel has its own rubber texture distinct from that used on the side grips. The design is all over the place. The front even has a vertical grille for a race car aesthetic that the rest of the mouse doesn’t share. The lighting is underwhelming for RGB fans. The Corsair logo on the palm isn’t much to look at, especially when our hand covers it right up. And, the RGB of the middle mouse button is barely visible in well-lit environments. No dazzling light show from the Profile and DPI indicators either. Aside from the curious looks, the build itself stands out positively. The body is fairly wide, making it a comfortable option for large hands. And, at 105g, it has decent heft, though it lacks customizable weights. One diamond-textured grip extends for almost the full length of our thumb, allowing us to get a good purchase on it. The right side also has a nice section of the same material, giving both palm and claw grips plenty of traction for a secure hold. The Ironclaw RGB has a braided cable with a lightly reinforced mouse end that feels sturdy. Altogether, the build of this mouse feels incredibly strong, with no hollow clack when moving it around. And, with Omron switches rated for 50 million clicks, the buttons should hold up a long time as well. The Ironclaw RGB is targeting serious gamers with some serious specs. It offers a sensitivity range from 100 to 18,000 DPI, and is adjustable in one-step increments. Who needs that high of sensitivity or that granular adjustability? We don’t know, but it’s not hurting the mouse in any way and the price isn’t blown up because of it. With a 1,000Hz polling rate, the Ironclaw RGB is unsurprisingly responsive. Running games on a 144Hz monitor, we don’t notice any input lag or other tracking faults. We’re fans of the big sweeping arm movements for in-game control, and the Ironclaw RGB’s tolerances for accelerations up to 50G and speeds up to 400 inches-per-second (IPS) put it on par with the best mice. We never see it failing to keep up with our movements when swinging around corners or snapping onto targets. Corsair includes a surface calibration tool in the iCue customization software (which, it’s worth noting, can be a bit confusing to use), but we’re not sure it made much difference. We calibrated to one surface, and continued to use the mouse on other surfaces, but we didn’t notice any issues with accuracy. The button experience is mostly positive, but not so perfect. Despite not having physically split mouse buttons, clicking feels surprisingly consistent no matter where your fingers will likely rest. We have no trouble clicking in a quick double tap to hopefully put down an enemy in Insurgency: Sandstorm. The side buttons rest comfortably out of the way when flicking around, but are easily accessible by rolling our thumb up. They also offer enough resistance that they don’t accidentally trigger when picking up the mouse. The only real issue is the heavy middle mouse button. It takes noticeably more pressure to push down than the left and right click. The same light tap that can actuate the left and right mouse buttons won’t do it for the middle mouse button. In a situation where a quick melee attack may be necessary, the heavy middle click can slow things down. The Corsair Ironclaw RGB puts a lot on offer for such an affordable mouse. It’s tracking is impressive and doesn’t fall short of its closest competitors. The construction is solid, and feels both firm and secure in the hand. Aside from some curious design choices and a middle mouse button that takes a little extra pressure to use, we find little in the Ironclaw RGB to complain about. 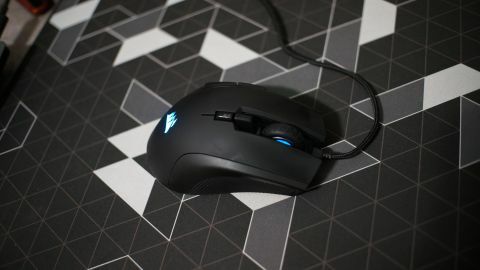 Anyone looking for a high-performance gaming mouse should have no qualms about picking this one, especially if they have big hands and a tendency to be rough with their mouse.